ATLANTA — Modest Mouse has been touring most of the year in support of their CD, We Were Dead Before The Ship Even Sank. They will finish up performing at several radio station Christmas shows with stops in Seattle, San Francisco, Los Angeles, Grand Prairie, TX and finishing up in Atlanta at the 99X Mistle Toe Jam. With the D8 two-way, full-range box and the SUB 112 subwoofer, Dynacord has added two new speaker systems to the D-Lite series that are designed to be compact, but maintain the power of other D-Lite products. According to the company, both new models in the D-Lite series reportedly feature extensive sound pressure levels, low distortion and compact dimensions. 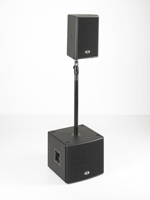 Both products are designed for mobile and fixed professional sound reinforcement applications. 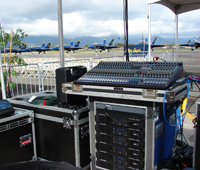 KANEOHE BAY, OAHU — Custom Audio Hawaii recently deployed its Dynacord PowerH amplifiers to power the P.A. for the 2007 “Blues on the Bay” airshow at the Marine Corps Base Hawaii (MCBH), Kaneohe Bay, Oahu, featuring the United States Navy Blue Angels flight demonstration squadron. In addition to the main attraction, the weekend’s events included skydiving demonstrations, car shows, carnival rides, and aerobatic demonstrations. NEW YORK — As a fitting cap to Crown International’s 60th anniversary year, the DC 300 amplifier first introduced 40 years ago in 1967, was inducted into the TECnology Hall Of Fame. Gerald Stanley, Crown International’s senior VP of R&D and the original designer of the DC 300, was on hand to accept the award. MOUNTAIN VIEW, CA — Hosted by Neil Young, the annual Bridge School Benefit concerts are unique in one important respect: no backline amplifiers are allowed on stage. 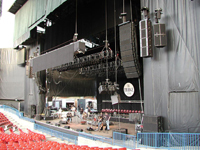 As in previous years, organizers of this ultimate unplugged concert series held at the Shoreline Amphitheatre in Mountain View, Calif., turned to Hayward-based Sound On Stage for an L-ACOUSTICS loudspeaker system to reinforce the acoustic sets of an eclectic lineup of artists including Metallica, Jerry Lee Lewis, Tom Waits fronting the Kronos Quartet, John Mayer and, of course, Neil Young. TORONTO, ONTARIO — The Modern is a new nightclub located on Alexander Street in Vancouver’s thriving Gastown. Modern Club’s new owners decided that in addition to a complete architectural overhaul, a new sound system was in order as the Modern prides itself in making music a top priority, selecting top local DJ’s to partner with Canadian and international DJ talent. The SB28 is designed as the successor to its SB218 subwoofer. The four-ohm SB28 contains two front-loaded, 18-inch direct radiating transducers integrated into a bass-reflex tuned enclosure capable of operating down to 25 Hz. REGINA, SASKATCHEWAN – For the past 26 years, the annual broadcast of the Canadian Country Music Awards has recognized and celebrated the best in Canadian country music. For this year’s event held at the Brandt Centre in Regina, Saskatchewan, Toronto-based P.A. 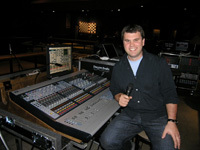 Plus Productions chose to recognize another performer, the Soundcraft Vi6 digital live sound console, which was deployed as the monitor desk for the entire show. MAYSVILLE, GA – Maysville Baptist Church in Maysville, Ga, had the very best of problems. Tremendous growth had pushed their small downtown church to its limits. Unable to expand at their downtown location, the church purchased a 50-acre tract on the outskirts of Maysville and began a nearly two-year project to design and build an elegant, 500-seat worship center with state-of-the-art sound reinforcement and video projection systems. LONDON — ADLIB Audio supplied their new Digidesign D-Show Venue live mixing console and new VerTec subs for multiple-award winning Denver-based piano rockers The Fray, along with full audio production and crew for the band's recent UK Tour. ORLANDO, FL — The 2007 Parnelli Awards gala honored the best and brightest of the live event industry Friday, Nov. 16, at the Peabody Hotel in Orlando, Fla. The hundreds in attendance constituted a Who’s Who of players in the live event industry, and they all rose to their feet in honor of Lifetime Achievement award winner Gerry Stickells and Audio Innovator award winner Bob Heil. Even the stars paid their respect, with members of Velvet Revolver, Queen and Jimi Hendrix’s band offering their kudos via video. All the Parnelli winners — as voted on by readers of PLSN and FOH — were celebrated in the awards ceremony that honors the best of our business.